The quintessential bay window style has always been an issue with soft furnishings such as curtains so this is where shutter systems come in. Architects are opting for shutters where bay windows are concerned due to the stylish and inviting appeal they create. Bay window shutters also offer a great deal of kerb appeal. Bay Window Shutters are a great window covering option as they acheive a very modern look whilst giving you great privacy and noise reduction. All of our hardwood window shutters come with a 3-year guarantee and a very wide range of colours and stains. Bay windows are designed to make the most of sunlight in your home, and shutters help you get the light levels just right, whatever the time of day. Rather than other window coverings, which need to be either fully open or closed, shutters can simply be tilted to avoid the direct glare of the sun. Helping you show off the architectural features of your bay, window shutters are made-to-measure just for you. 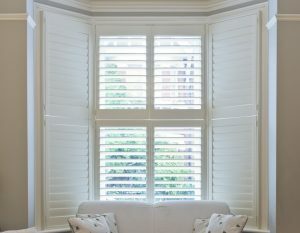 Imagine your bay free from tracks, cords or material, replaced with the elegant, simple lines of plantation shutters. We have been supplying and fitting shutters for 15 years but within the last few years we have seen a significant increase in demand for shutters. The look they give from outside the house creates huge kerb appeal which also adds value to your property. We have found that estate agents add value to the the property if shutters are installed due to the kerb appeal and all the other qualities they bring to your window. We only supply and fit hardwood plantation shutters at a better price than MDF shutters. All of our window shutters and frames are made from Hardwood as standard unlike many companies who sell plastic or MDF as standard and try up sell Hardwood.